Traverse from the far west coast of Canada all the way to Hudson Bay to view grizzly bears and polar bears at the ideal viewing time. 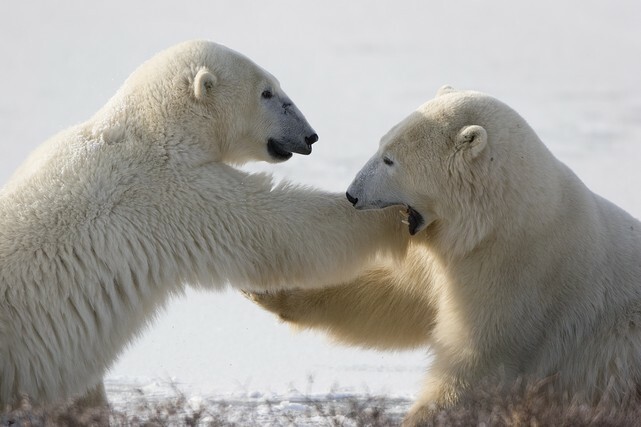 For just a special few weeks each year, witness both polar bears and grizzly bears in their natural habitat. From the lush and abundant Great Bear Rainforest, to the barren arctic tundra of Churchill, no safari better represents Canada’s immense diversity. Expert naturalist guides provide the story of these great animals as you focus on viewing and photography. For the true wildlife enthusiast, this is a vacation you will always remember. Once a year grizzly bears gather in the Great Bear Rainforest to gorge themselves on Salmon. This is the most exciting and easiest time to see grizzlies in their natural habitat. The highlight of travelling to Canada’s north to view polar bears is the moment when a curious bear comes up to the specialized tundra buggy to say hello – there is no greater thrill than being so close to such a powerful animal. Grizzly bears and polar bears are not the only wildlife you will see on this unforgettable adventure. With orca whales on the West Coast to Arctic fox on the tundra, your camera will be working overtime! Welcome to our hometown – a famously lovely west coast city, surrounded by mountains and ocean. This morning you will depart Vancouver and fly to Campbell River to start your grizzly bear experience. This scenic and quick flight is the easiest way to get from Vancouver to Campbell River. Canada's best grizzly bear viewing location, Knight Inlet Lodge, is nestled in a quiet cove on the emerald waters of Knight Inlet in British Columbia.Fly to Campbell River and check in to your hotel. The remainder of the day is yours to explore the “Salmon Fishing Capital of the World”. Your Knight Inlet Lodge experience begins. Get ready to begin an exciting day of grizzly bear tours, adventure, and relaxing (of course!) The flight heading for Knight Inlet Lodge takes roughly 30 minutes. Spend the rest of the day participating in one of several activities available at the lodge, including kayaking, hiking, and wildlife viewing or spend the day on a grizzly bear tour. This time of year, the usually solitary bears gather on the rivers to hunt spawning salmon. Your Knight Inlet Lodge experience continues. Your grizzly bear viewing at the rustic Knight Inlet Lodge continues. Relax in the vast west coast wilderness, choose a lodge activity, or go grizzly bear viewing accompanied by an experienced guide. The choices are limitless! Travel back to Vancouver today. Get up early to soak in the fresh wilderness air, perhaps spotting a grazing deer or two as you sip your coffee. Today you'll have another opportunity to go bear viewing before you fly back to Campbell River. Relax during this scenic flight from Campbell River to the Vancouver Airport South. A private vehicle and driver will meet you at the airport and take you in comfort to your Vancouver hotel. Spend the day relaxing in Vancouver. Ask us about booking a sightseeing tour for you – walking tours, bike tours, food tours, and nature tours are available to suit all interests. Surrounded by mountains and ocean, Vancouver is one of the few cities in the world where a typical day might include a relaxing sail, round of golf, and an evening enjoying the nightlife on Granville Street or in Yaletown. Chinatown, Gastown, and Granville Island are some of the most popular spots. If you love a physical challenge, try the Grouse Grind. Capilano Suspension Bridge is also a favourite destination for locals and tourists alike. Open year-round, daytime views are not for the faint of heart. We suggest renting a bicycle and cycling around our famous Seawall and Stanley Park. Stop at English Bay for the ocean view and a bite to eat, or head to Robson Street to shop at the trendy stores. Later, catch the tram to the top of Grouse Mountain for a cocktail at sunset. Spend a leisurely morning in our beautiful West Coast city, before boarding a flight to Winnipeg. Meet your group and guide this evening, before your polar bear adventure begins early tomorrow morning. A private driver will meet you at your hotel, and take you to the airport in time for your flight. To ensure you are comfortable in Churchill's cold temperatures, ask us about winter clothing rentals. Options include Canada Goose parkas and snow pants, plus Baffin snow boots. We highly recommend you do this early, as availability is limited! Head north to the remote town of Churchill, located on the western edge of the Hudson Bay. Get almost nose-to-nose with one of the most feared predators in the world on your first day of your Tundra Buggy adventure. Another day out on the Tundra! With an expert guide and the convenience of small groups your experience will be truly memorable. Another day of activities today in Churchill before returning to Winnipeg. Your lords of the wilderness trip comes to an end today. This trip is available for departures between September and October.